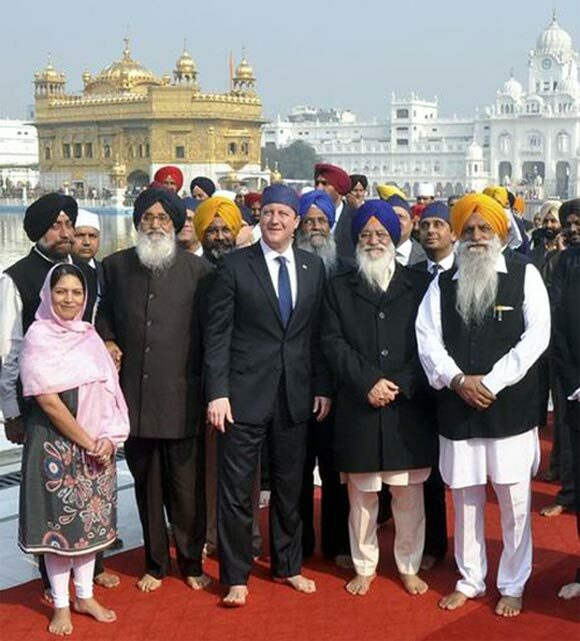 British Prime Minister David Cameron on Wednesday paid obeisance at the holiest shrine of Sikh religion Golden Temple where he was presented a robe of honour. Amid tight security arrangements, Cameron paid obeisance inside the sanctum sanctorum at 10.25 am. Clad in a dark suit and a tie with head covered with a blue-coloured cloth, Cameron was presented a robe of honour inside the sanctum sanctorum of Harmandir Sahib, popularly known as the Golden Temple. The British prime minister also mingled with a couple of devotees and chatted with them for a brief period as Gurbani played in the backdrop. This is the first visit by a high-profile British dignitary to Amritsar after 1997, when Queen Elizabeth II and her husband Prince Philip, the Duke of Edinburgh, had visited the holy City. Inside the Temple, he was accompanied by Punjab Chief Minister Parkash Singh Badal, who earlier received the British dignitary at the Sri Guru Ram Dasji International Airport, Shiromani Gurdwara Prabandhak Committee President Avtar Singh Makkar, among others. The British prime minister reached the Golden Temple at about 9.50 am and spend nearly an hour inside. Before paying obeisance by bowing his head inside the sanctum sanctorum, the British leader was taken around the temple by officials of the SGPC, apex religious body of the Sikhs, and was also shown Shri Guru Ram Dass Langar Hall. Cameron had his hands folded for a brief period as he paid obeisance inside the sanctum sanctorum of the Golden Temple, which attracts a large number of devotees cutting across faiths from different parts of the world. Notably, Sikhs constitute a large segment of Indian origin people who are settled in the UK. Around 3,000 police personnel from six districts have been deployed along with other forces, as part of the tight security arrangements, which includes Israel-trained Special Weapons and Tactics (SWAT) team. Snipers have also positioned themselves on the rooftops of the buildings situated in the vicinity of the Golden Temple, Jallianwala Bagh and at other spots from where Cameron's cavalcade is to pass. Forces in plainclothes have also been deployed at numerous points in the city as part of beefed up security arrangements, police sources said. On Tuesday, security agencies had carried out a mock drill in view of Cameron's visit. Accompanied by Badal, Makkar and his official delegation, Cameron took a full round of the marbled periphery of the Temple before entering the sanctum sanctorum. Before paying obeisance, he visited the community kitchen of the Golden Temple where he spent almost five minutes keenly watching the cooking process. He then interacted with three devotees and shook hands with them. In the sanctum sanctorum, he was honoured with a saffron scarf offered by the Sikh head priest. 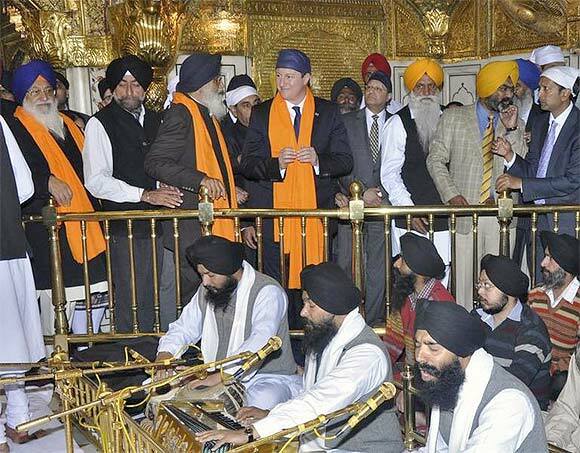 Image: Britain's Prime Minister David Cameron poses inside the premises of the holy Sikh shrine the Golden temple in Amritsar. During his two-minute stay inside the sanctum sanctorum, he stood with folded hands. He also stood for a few seconds before the Akal Takht (highest Sikh temporal seat) situated in the marbled periphery. Information officer of the Golden Temple Jaswinder Singh briefed him about the importance of Akal Takht, the brief history of the pious Sikh shrine and history of the founder of Sikhism Guru Nanak Dev. Jassi also told him about the importance of recitation of Guru Granth Sahib. Jassi said the British prime minister showed keen interest in Sikh history and culture, particularly tenets of Sikhism. Before leaving the Golden Temple, he was presented with a replica of the Golden Temple, a set of Sikh religious books, a pictorial book comprising a Sikh encyclopedia and woolen shawls. While leaving, Cameron simply wrote 'Thanks' in the visitor book of the Golden Temple. 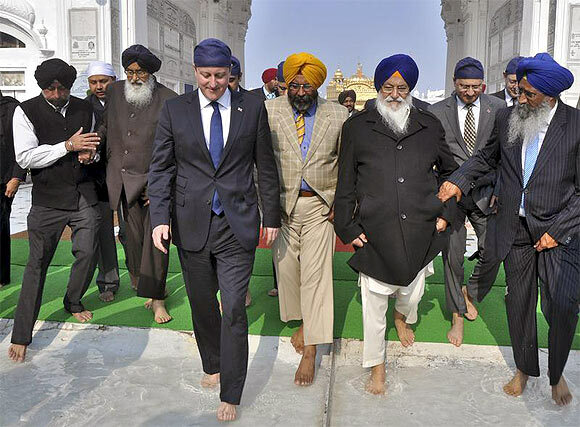 Cameron is the highest democratically elected leader from Britain to visit the Sikh shrine. Commenting on his visit, Makkar said it would send a positive message to the Sikh community around the globe. After visiting the Sikh shrine, he visited the Jallianwala Bagh and factory of a basmati rice brand which exports to Britain and other countries.